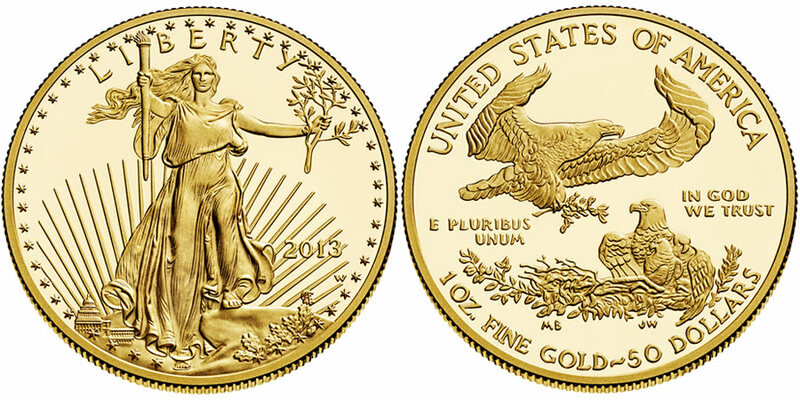 The 2013 American Eagle Gold Proof Coin is offered from the United States Mint as a numismatic version of the popular bullion Gold Eagle Program. Like the related bullion strikes, the proof coins are typically produced in four different sizes including one ounce, 1/2 ounce, 1/4 ounce and 1/10 ounce. All gold eagles contain the same basic imagery on both their obverse and reverse. The obverse depicts Augustus Saint-Gaudens' version of Liberty as first seen on the 1907 Double Eagle. This design has long been considered one of the most beautiful ever struck on an American coin by many in the industry. Gold Eagles first appeared from the United States Mint in 1986. They have been struck annually since that point in both bullion and proof varieties with uncirculated versions debuting in 2006. An exception to the annual rule occurred in 2009 when bullion demand forced the US Mint to cancel numismatic production. The US Mint describes the process of proof coin production with "The coin is struck multiple times so the softly frosted, yet detailed images seem to float above a mirror-like field." Augustus Saint-Gaudens Liberty image is featured on the obverse of all American Gold Eagle Coins. It debuted on the 1907 $20 Double Eagle Gold Piece and has since earned the distinction of being considered one of the most beautiful designs ever to grace and American coin. Obverse inscriptions surrounding the design include "LIBERTY" and the year of production. A family of eagles is depicted on the reverse of each coin. The design was originally completed by Mrs. Miley Frances Busiek and is surrounded by the inscriptions of "UNITED STATES OF AMERICA", "E PLURIBUS UNUM", and "IN GOD WE TRUST". Gold content and legal tender face value are also inscribed on the reverse.